The story we're about to read is two-pages long... consisting of ten panels. And yet, it requires TWO editors. Keep in mind, that's one more editor than Crisis on Infinite Earths had! Is this a "current year" issue?! Reminds me of those ridiculous Marvel Harley Davidson ads from a few years ago... one pagers, with like three editors credited. I guess everybody needs to feel important. Superman flies back into Metropolis proper, as he runs through the events of the past few chapters in his head. We know that the man he saved is named Bob Galt, and he's part of a sort of "Church of Superman". 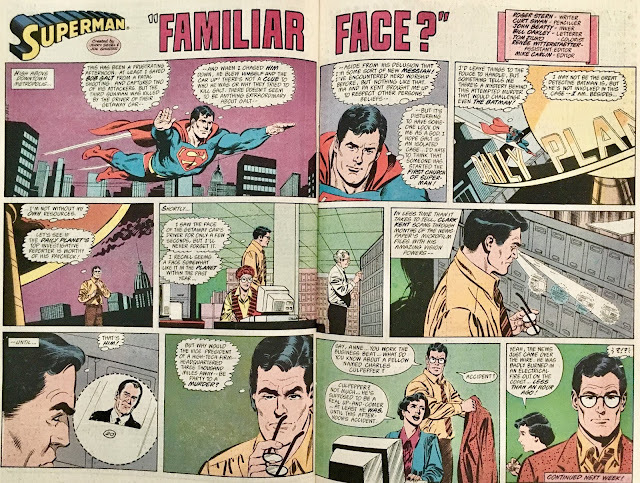 Using his super-photographic memory, Superman recalls the face of the getaway driver, and decides to scan the Daily Planet records to see if can can put a name to that face. Turns out, it's a fella named Charles Culpepper, the Vice-President of a High-Tech Firm some three-thousand miles away from Metropolis. It also turns out, that this Culpepper was just burned in an electrical fire out on the coast! Alright... this was probably the strongest "chapter" yet... though, we still didn't get all that much. Superman "Kents down" and goes through some microfiche to deduce that the getaway driver (who exploded in his arms) is actually a Tech VP from the West Coast. So, I'm going to guess we're looking at a body double... or a twin, or something?! Either way, this feature is finally getting around to giving us a hint of intrigue, so I'm not going to complain! Maybe these two-pagers are ill-equipped for a Superman story... but, just the right size for a Clark Kent one? 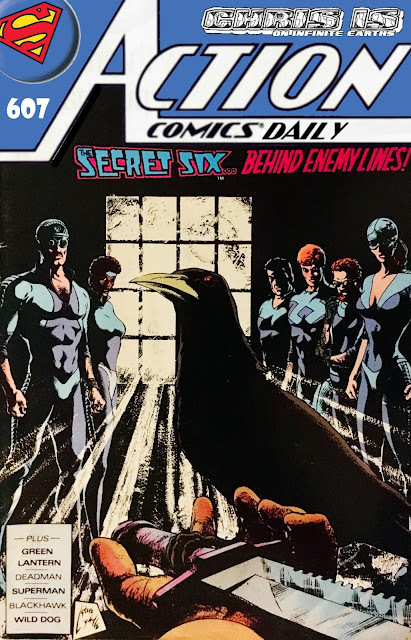 Tomorrow: Rafael meets the Secret Six!